Students listen to Dr. David Corbin as he speaks about order and chaos at the Interregnum XV Opening Lecture on April 9, 2019. || Photo credit to Gabriela Kressley. *For added clarification: No students pictured were found to be associated with the incident. As the caption states, they are listening to the lecture as audience members and part of their Interregnum requirement. 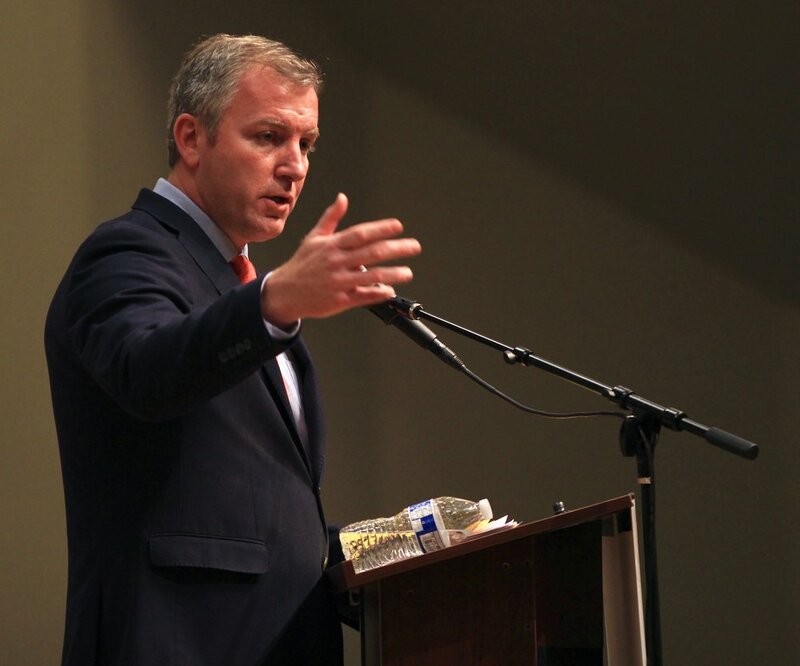 Former professor Dr. David Corbin spoke to students about the tensions of order and chaos, and the necessity of unity and meekness at Interregnum XV’s opening lecture. As Corbin delivered his address, arguing that togetherness is central to the cultivation of order, a student—under the guise of an account named tkc.edu— airdropped divisive memes to several cell phones. Dr. David Corbin giving the opening lecture on April 9, 2019. || Photo credit to Gabriela Kressley. In a quick response to these events, President Tim Gibson addressed an email to the entire student body announcing that racist messages will not be tolerated and will be investigated by the college. “Racial or ethnic slurs, personal insults, and abusive language have no place in our online or in-person conversations.” Gibson wrote. Sha Sanders, a King’s sophomore and member of the Table, found out about this when her friends shared in their group chat what they had received. She thinks this outburst was symptomatic of a more systemic issue. “I was honestly mad, but not surprised. The memes sent were just the tip of the iceberg for subliminal racism that runs rampant through King’s,” Sanders said. Several students reported receiving images of this variety. Derogatory jokes, centered around racial, sexist, and anti-LGBTQ slurs, circulated through the audience. Holly Thomas, a King’s senior, received a meme, which made fun of the increased suicide risk amongst transgender individuals. “These are disgusting,” Thomas said. To the students (?) 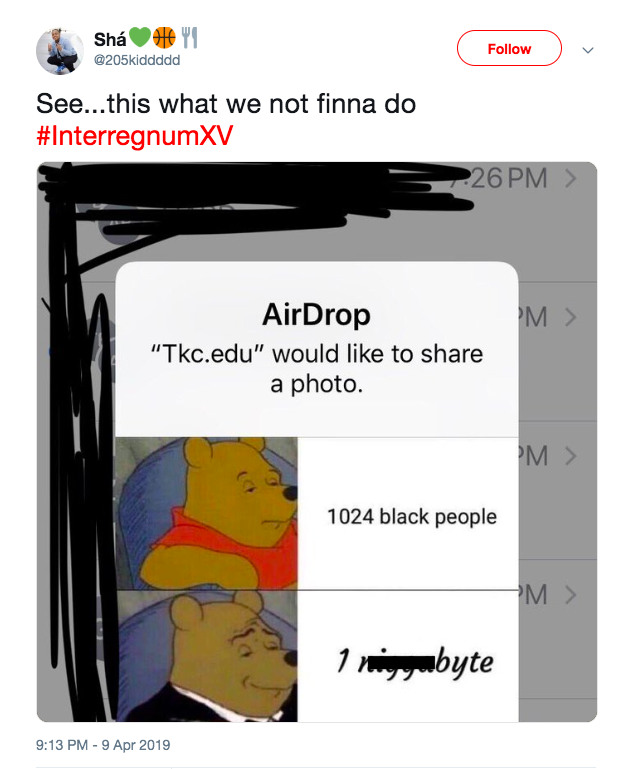 who are sending anonymous racist, anti-Semitic, and homophobic messages via the #InterregnumXV hashtag or AirDrop ... you must know that your ignorant hate isn’t welcome here, since you’re keeping anonymous. But you should also know this isn’t healthy for you. In his email, Gibson condemned the behavior, and asked for any information which might help identify the offender. While she admires Gibsons’ willingness to speak out, Sanders remains skeptical of the email’s effectiveness.